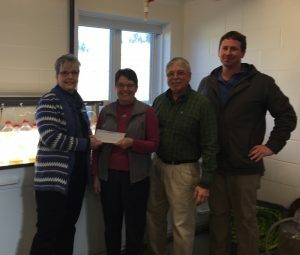 Wendy Beal, left, Manager of the Jonesport banking center of Camden National Bank, presents DEI Board of Directors with a check to support DEI’s education programs. DEI board members, left to right, are Chair Lynn Alley (Beals), Wes Hedlund (Newburg), and Jason Alley (Jonesport). BEALS — Camden National Bank recently announced that they are donating $5,000 over the next two years to the Downeast Institute’s (DEI) Education Center. The Education Center is the home to DEI’s Let’s Find Out Kindergarten through 12th grade science and math education programming, which provides exploration of the scientific process through immersion in the marine environment. The bank’s donation will support the purchase of a teleconferencing system. Camden National Bank is a full-service community bank founded in 1875 that offers an array of consumer and business financial products and services, accompanied by the latest in digital banking technology. The Bank provides personalized service through a network of 60 banking centers, 71 ATMs, and lending offices in New Hampshire and Massachusetts, all complemented by 24/7 live phone support.